Florawall is a green indoor wall made of living plants. It gives rooms a fresh look and enhances your well-being: in offices, lobby areas, meeting rooms, hotels, shopping malls, showrooms, but also on stages and at events. WE plan and produce your Florawall. YOU determine the size it is to have. WE can create designs that will even integrate YOUR logo or lettering. The great thing about a vertical garden is that it entails almost no tending. It is even self-irrigating. Soil is totally unsuitable for vertical green systems. It is dirty and causes a moldy smell to permeate rooms. Apart from that, it develops mold and constantly discharges a considerable amount of fungal spores into the ambient air. 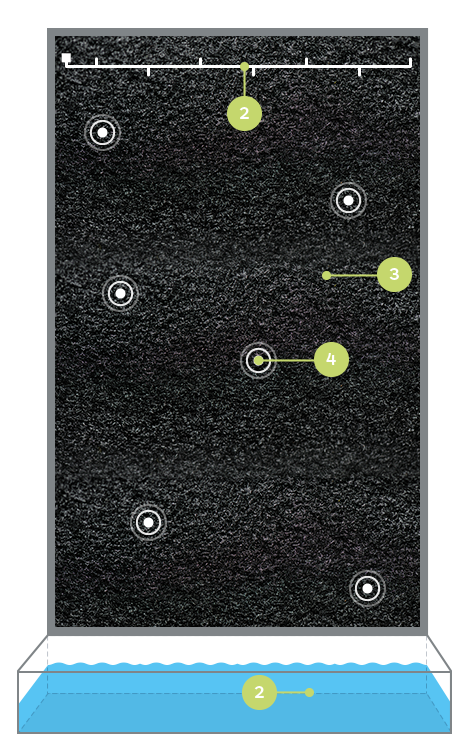 Florawall prevents lapses of concentration, reduces CO² concentration in rooms, leads to fewer stress symptoms and filters out indoor air pollutants. It soothes the mind, just like a small garden – no matter how distressing your job might be. Choose either a longitudinal or transverse shape and select your preferred size, plant and frame color. Would you like your Florawall to serve as a bulletin board? Just tell us the color. 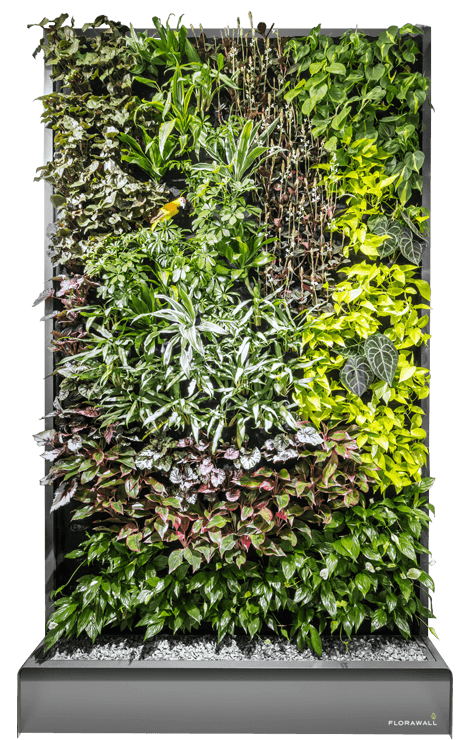 You can choose from among more than 100 different plants to have your wall decorated from the outside. This allows you to achieve any atmospheric effect you like. Our system is based on hydroponic technology. Plants are kept in water, that is, in fleece specifically designed for that use. By the way, this makes our product highly slim with minimum space requirements. High-tech installed behind plants: Sensors will notify us automatically if plants are kept too dry or need more nutrients. Our central office will be notified duly and signal to us that action is required. Where there is a Florawall, there are no withered desert plants but evergreen plant paintings. How come we claim it so boldly? 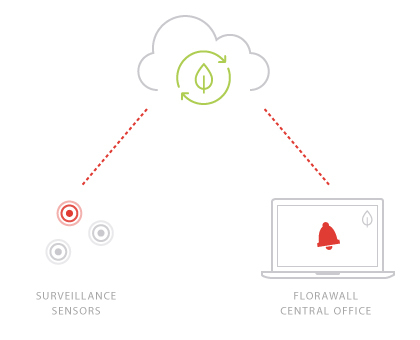 It is as easy as this: When installing your Florawall we use a monitoring system that is designed to surveil your Florawall 24/7. Your Florawall is connected to our central office around the clock. Should your Florawall ever fail to work properly or should conditions change, we will be the first to know and take immediate action. You won’t even notice it. Rely on our innovative quality management system and rest assured that you will always have lush green beautiful plants. We guarantee that this will come with your Florawall Care Package at no extra charge. It is possible to assess and thus increase the level of air humidity to a pre-defined target level in rooms. In new building projects we use these indicators to scale down housing technology ahead of the implementation of your Florawall. Service is not ’our success‘ but the pre-condition for our success. We are impassioned about the green world and we are passionate about making you happy with your Florawall. 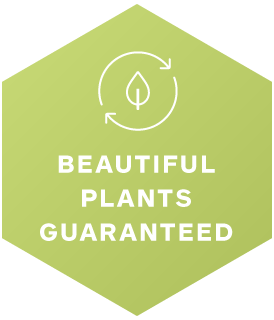 We give your plants a fully-fledged spa treatment on a regular basis. No dirt, no bad smell, no watering – but pure health. The green interior wall reduces the amount of dust particles in the air and filters nicotine and formaldehyde out of the air. Our qualified mounting team and florists are in charge of installing and planting the greenery in your Florawall. Your plants receive a fully-fledged spa treatment four times a year. We supply plant nutrients and clean the ducts and pumps. Request an offer for your personalized Florawall. We like sharing with you – in particular our long-term experience. We offer you face-to-face appointments and plan your project at your location free of charge.